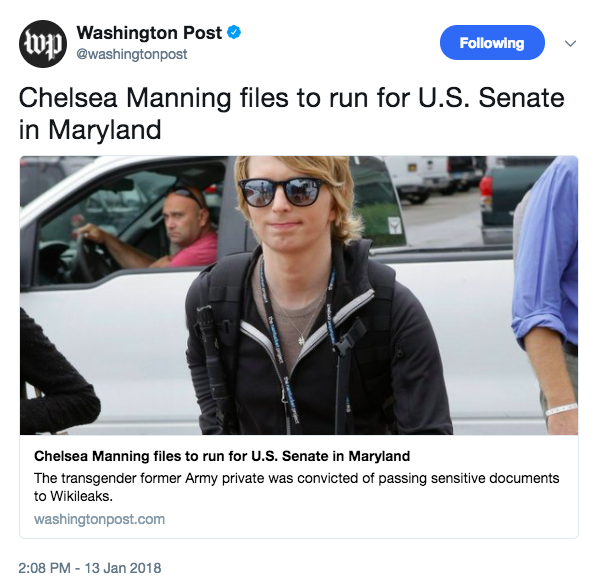 Chelsea Manning has filed to run for U.S. Senate in Maryland, according to Federal Election Commission (FEC) filings dated Jan. 11. Manning filed to run as a Democrat. The age requirement to run for U.S. Senate is 30 years old. Manning would challenge Democrat Ben Cardin. Cardin’s seat is up for re-election in November; Cardin has served two terms in the U.S. Senate representing Maryland. When the military denied Manning’s request for hormones, Manning tried to commit suicide twice. Manning will remain an unpaid active duty soldier who is eligible for health care and other benefits. To many people, Manning is an American traitor who does not deserve the spotlight or a public platform, let alone recognition for anything. Manning most recently attacked law enforcement on National Law Enforcement Day. While people took time to recognize the achievements of law enforcement this past Tuesday, Manning took to Twitter to slam law enforcement. Manning continued with a number of tweets attacking law enforcement with a number of unverified statistics. “Police and prosecutors steal more through ‘civil asset forfeiture’ than all ‘property crime’ combined,” Manning wrote. “Police kill hundreds of people every year with absolute impunity,” Manning continued. Last September, Manning was denied entrance into Canada due to a criminal record.